Well the time had finally arrived again and it was time to head back to France again in search of some monsters. 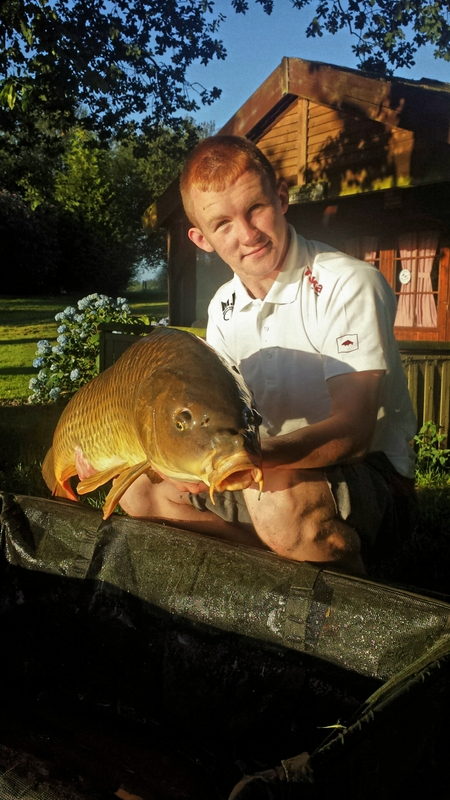 Our previous trip which was in April and also our first ever trip abroad fishing for carp proved very successful. 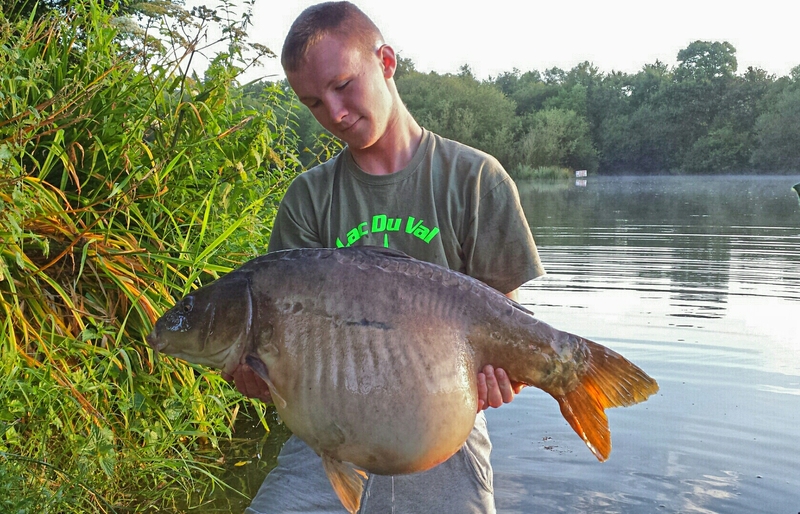 We landed a total of 31 carp between us with my biggest being a 42lb mirror. It was a brilliant trip with some lovely carp caught. It was August 13th and as we set sail for Cherbourg, me and my good friend Matthew were full of excitement and could not wait to get fishing. It was a relief to be finally on the boat after all the stress of the previous week with all that had happened. At one stage we thought the trip wasn’t going ahead due to motor problems with Matthew’s car but that’s another story. We were en route to Lac Du Val and that was the main thing! After nearly a full day travelling and both of us absolutely exhausted we were finally standing looking at the wonderful views the lake had to offer. The sense of tiredness completely left my body with a burst of excitement taking over me. It was good to be back. After a quick chat with the owners Sammy and Dave, they updated us on how the lake was fishing and all sounded good. We were told they were active and seemed to be on the munch. Just what we wanted to hear. 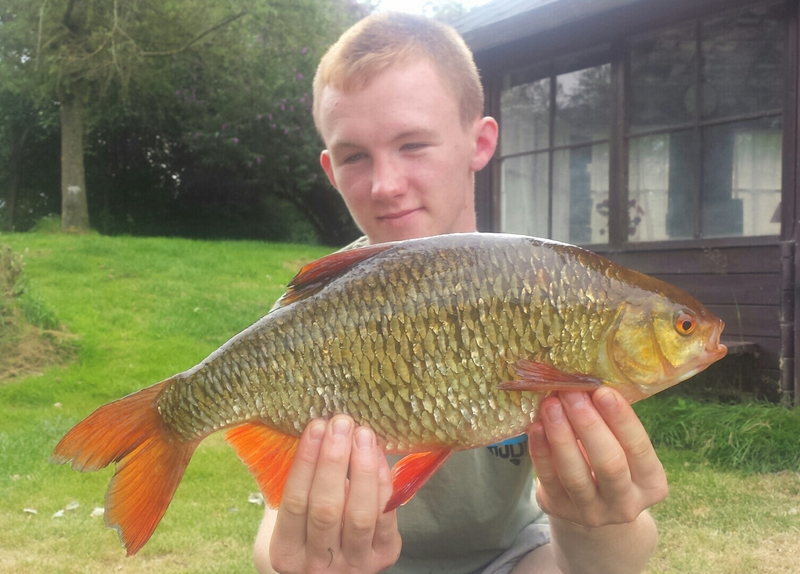 On our last trip Matthew fished peg 2 which was the shallower end and I fished peg 4 that being the deeper end of the lake so this time I would fish peg 2 and Matthew would fish peg 4 we were both happy with this decision. The lake looked completely different to the last time we were here. The trees now had there leaves, flowers had blossomed and the lake just looked and felt more a alive this time round. My home (bivvy) was now set up for the week and it was time to think tactics and what way I was going to approach this swim. My right hand rod was placed with the bait boat over to the opposite margin to a dead tree overhanging into the lake at 21 wraps, my middle rod was then placed also using the bait boat into a small bay where I had seen fish cruising in the upper layers at 17 wraps and then my left hand rod was flicked out to a small, stumpy tree down the margin to my left which was known for some previous good catches in the past. Satisfied with my spots it was now time to get some bait onto them. My right and middle rod were fishing over to the opposite side of the lake so to bait up I had to walk around to the other side with my buckets consisting of pellet, tigers, hemp, corn, crushed boiling and tiger nut additive just to boost the attraction of the mix. My plan was to bait little and often. The rods were out and after we finished a delicious meal cooked by one of the owners, Sammy, the light was fading and it was time to see what the first night would have in store for us. 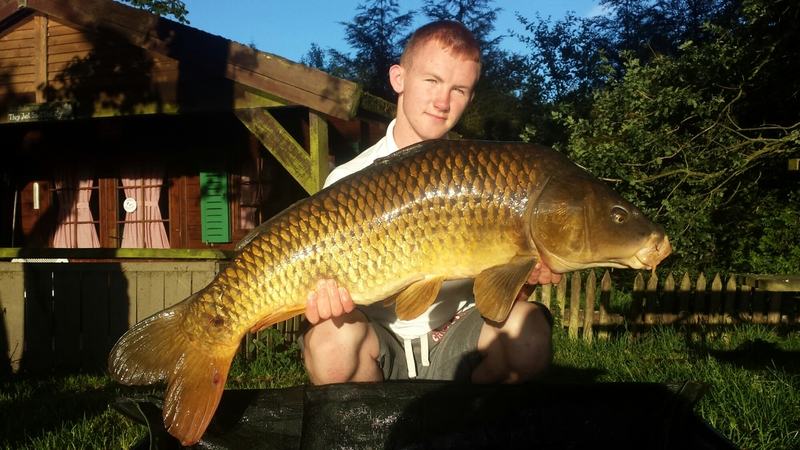 Matthew was first off the mark with a lovely 20lb common. It was good to see a fish on the bank. It wasn’t long after and my rod on the dead tree was away, resulting in my first fish of the trip, a pristine 19lb 2oz common. 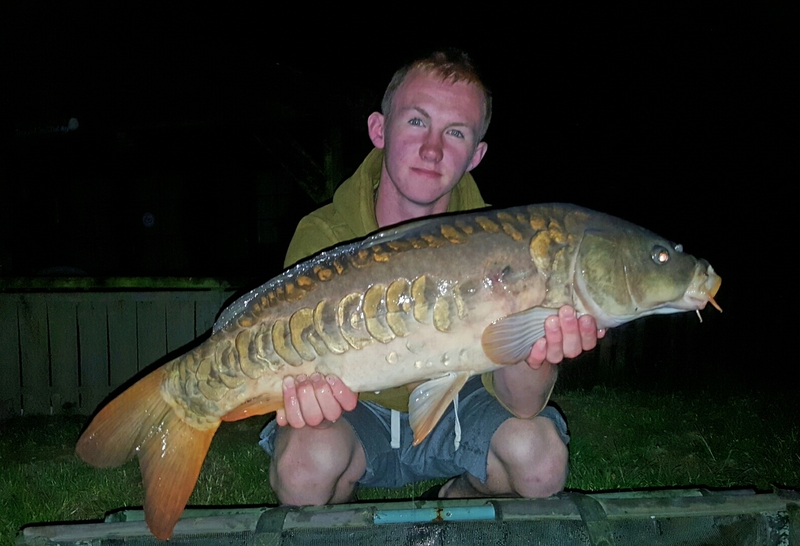 Just as I was releasing the fish my middle rod registered a bite, this time being a plump 22lb mirror. After getting the rods immediately back out onto the spots and a quick top up of bait I was heading to bed a happy man. The rest of the night was strangely quiet, but in the early hours of the morning my left hand rod down the margin was away. Just as I lifted the rod I could feel the line grinding off the branches of the stumpy tree resulting in the fish getting snagged! I kept constant pressure on the fish but unfortunately the hook pulled. After that incident I realised it was going to be difficult to land a fish on this rod, the lead had dropped and I was fishing with the clutch extremely tight but the fish still managed to find a way under the thick branches. That morning I looked about in search of a new spot and that I did. There was a small island to my left and at 8 wraps there was a small clear patch in amongst the weed, directly in front of a lilly bed. I quickly introduced ten spods of particle onto this spot in the hope of a quick bite. The second day passed uneventful, that evening I redone the three rods and put out fresh rigs that I had tied during the day. The rigs I was using were your standard bottom bait rigs as I like to keep things as simple as possible. Once I have a sharp reliable hook on the end I’m happy. Hybrid tackle who are my sponsor to date, supplied me with plenty of terminal tackle before heading to France, so tying fresh rigs constantly wasn’t a problem. On the hair I was using the boilies provided on the complex tipped with yellow or pink artificial corn. 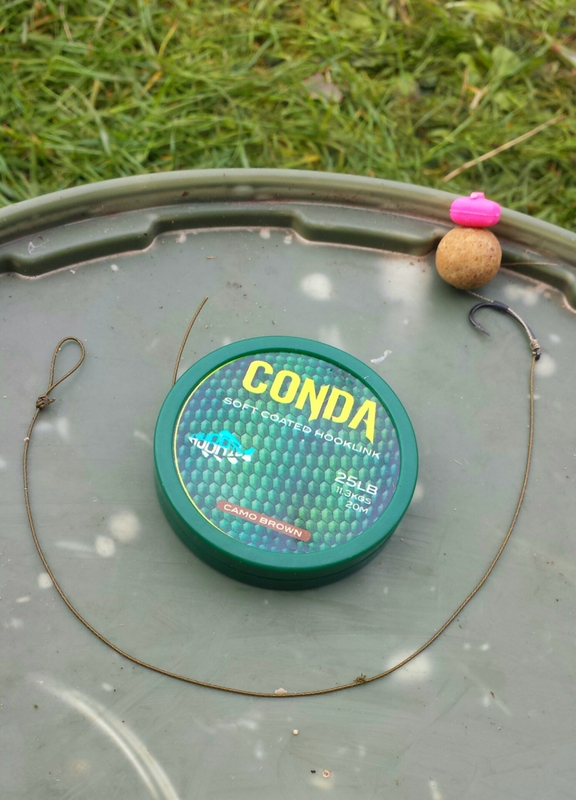 An easy rig to tie up but also very effective at the same time. The second night was upon us and after landing two middle doubles commons and a low twenty mirror off the dead tree. The rod I had moved from my left margin screamed off just as the sun was rising that morning. After a slow and steady fight, I was looking down at what I knew was my new pb common in the net. 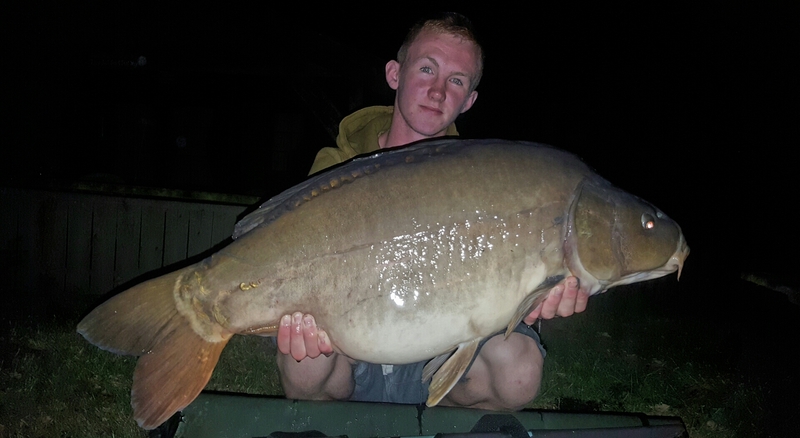 And a new pb it was, my previous biggest being 31lb 8oz. 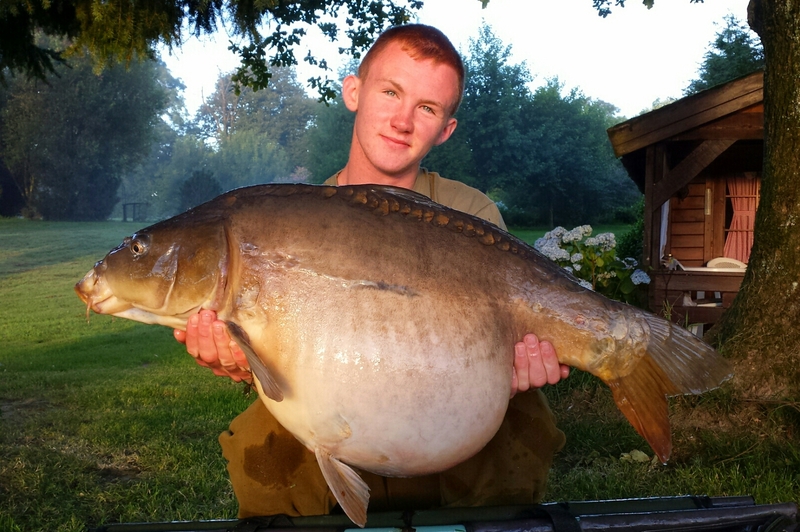 This fish weighed 33lb on the button and looked every ounce of it, you could have literally put a saddle on its back. The session was only starting and already I was made up. It was the third day of our trip and I decided to make a slight change and it definitely paid off. I moved my middle rod due to a lack of action on it, to a bamboo tree 21 wraps over to the opposite margin which was about 20 feet away from my rod at the dead tree. By the end of the third day I had landed another three twenty pound plus carp the biggest being 24lb. The madness continued for the following few days with constant action including my new pb tench weighing 6lb 8oz, a monster rudd of 4lb also a new pb and beautiful full linear mirror. It was turning into a session I had never expected. Literally exhausted with barely any sleep, even though I wasn’t complaining, I continued working hard in the hope of a monster carp would come along. The perseverance paid off and on the fifth morning, after landing a stunning 30lb 12oz mirror which I was over the moon with, my bobbin on the middle rod pulled tight and I was into what felt like a very heavy fish. After a long fight and a couple of heavy head shakes I was looking down at what I could only describe as a pig sitting in my net. My knees were trembling and the feeling of success rushed through my body I had got what I had came for. I quickly ran down to Matthew to inform him of what I had caught. With the scales zeroed Matthew lifted the sling with the fish inside. We waited a few seconds for the needle to settle, she weighed 40lb 6oz I was blown away. After plenty of pictures and some lovely water shots it was time to release her. It was an amazing sight looking at such a big fish swim away for the next lucky person to catch. Completely soaked and covered in carp slime it was time for a shower and a lovely fry to look forward to. As we finished breakfast Matthew and myself chatted about how well the trip was going so far and how we were really enjoying it. At the time I mentioned to Matthew that he was due a big fish. He had caught a lot of fish ranging from the low teens to the mid twenties so I had a feeling that it was only a matter of time before he landed a very big one and of that I was right! 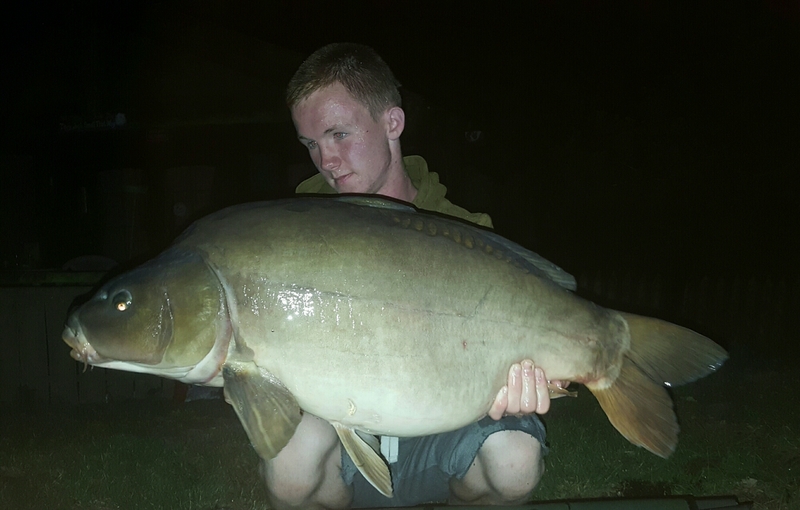 As I was just falling asleep that night after landing a beautiful 25lb mirror, Matthew alerted me he had just landed a big fish. I got my cross on and walked up to see a massive common lying on his unhooking mat. It went 39lb on the scales and I was absolutely buzzing for him as it was well deserved. Minutes later while standing with Matthew my reciever registered a violent take. The fight felt different and I had a feeling it wasn’t a carp due to the line it was taking and continued to stay deep throughout the fight. 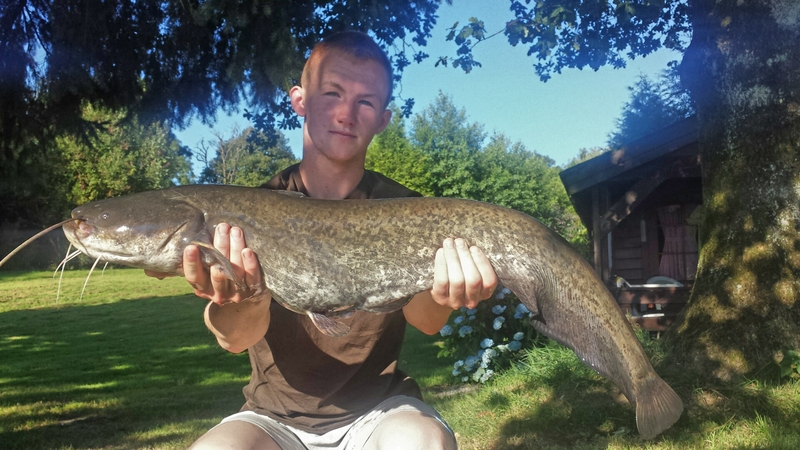 It turned out to be my first ever catfish, it wasn’t very big but my first one and I was more than happy. Not long after I was awoken again by Matthew, this time it was a recapture from our first trip in April. It was his first ever forty then but this time it was two ounces bigger. He was delighted as I was myself for him. 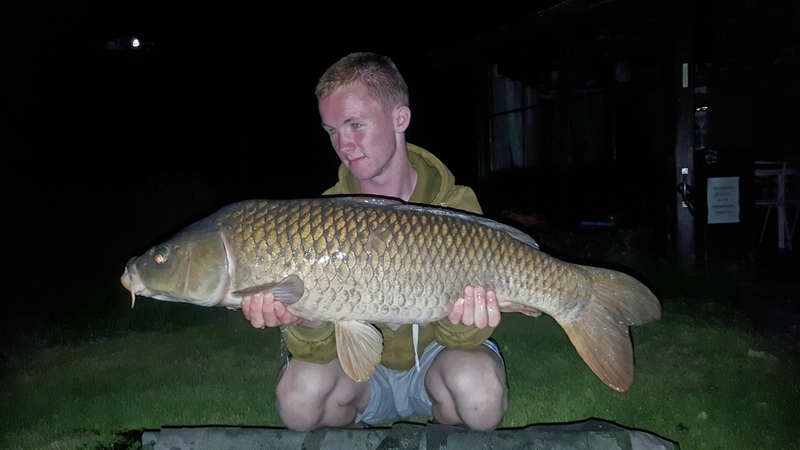 An unbelievable session it was turning out to be and with two nights left there was still time for one more big one. It was my rod at the bamboo tree that produced the 40 so I took a gamble and decided to bait up this spot heavily for the second last night. I introduced two kilo of boilies and a kilo of particle onto the spot. The gamble was to pay off. That night after landing a low twenty common on my left hand rod, I was just finishing spodding in the darkness when the rod on the bamboo tree melted off. After the longest thirty minutes of my life and my arm aching she was finally mine and I slipped the net under what looked like a brute of a mirror. I honestly thought looking at the fish it was 40lb + but at 35lb 6oz I was delighted and was happy that the heavy baiting was proving successful. After some photos and getting the rod back out onto the spot I was I was heading back to bed a happy carp angler. We had breakfast that morning and with only one more night left, I was eager to get the rods back out. With the rigs back on the spots I settled down to watch a film. It didn’t take long to be interrupted and connected to another angry carp. 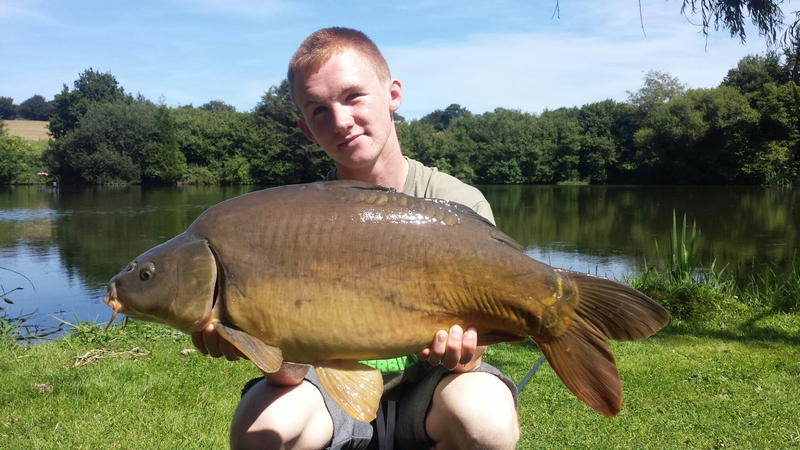 It turned out to be a 22lb 14oz mirror.The rest of the day passed without anymore action. That evening I baited up heavily again with another two kilo of boilies and plenty of particle and pellets as well. It was all or nothing at this stage, it was either going to pay off or not but it was a risk I was willing to take. The last night was upon us and with a long journey home ahead of us tomorrow, we decided to have an early night. Apart from one small mirror during the night it was slow but I wasn’t complaining. I had the best fishing experience and session of my life so far. I had finished up with just under 40 fish with a total weight of 658lb. I had worked hard and was rewarded. All those late nights walking around to the opposite side of the lake, half asleep topping up my spots, all of the early mornings observing the lake, and not forgetting the lack of sleep but it was all worth it and I loved every minute of it! 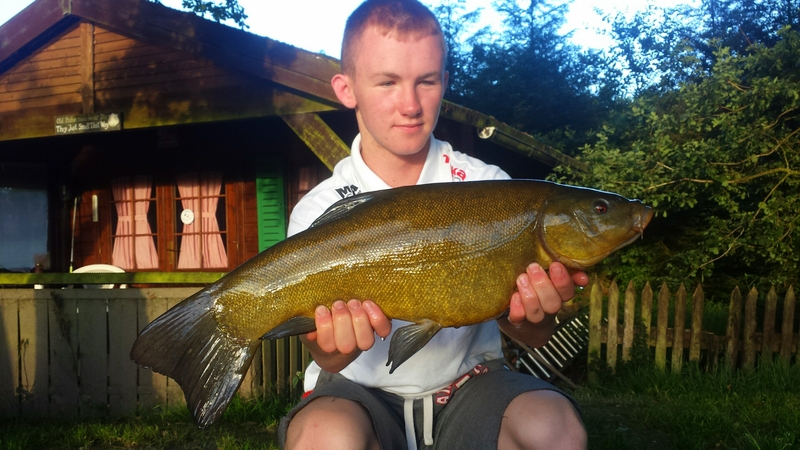 Car fishing and fishing in general is a big part of my life so to spend a week away in France with one of my best mates catching carp on a beautiful lake surrounded by nature, there is no better place on would have rather been. After adding up the total weights of the fish we had between us, it came close to 1100lb and in total landing 59 carp. Unfortunately it was time to leave this magnificent place and head home to our families and friends. As we said our goodbyes to Sammy and Dave, it was time to begin our long journey back to Dublin. Certainly a holiday I will remember for a long long time! 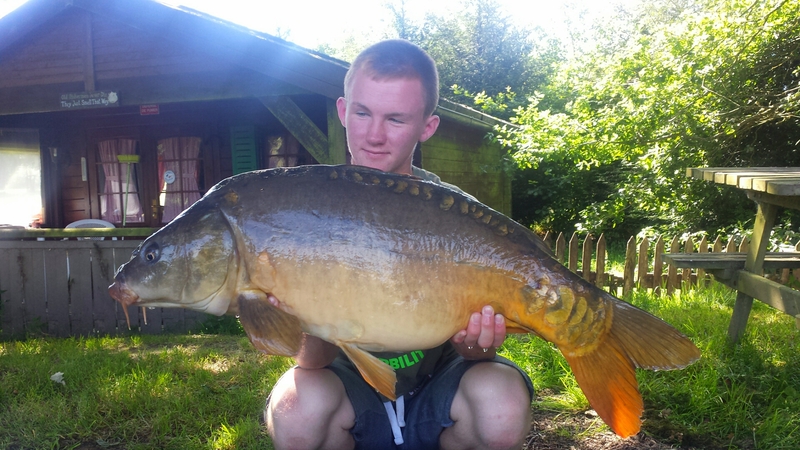 This entry was posted in Carp, Travel and tagged carp, Lac Du Val, Lloyd Lynch. Bookmark the permalink.